Antikythera (literally "opposite Kythera", Kythera is the next bigger island) is a small Greek island lying on the edge of the Aegean Sea, between Crete and Peloponnese. In April 1900, group of Greek sponge divers, found a wreck of an ancient Roman galleon at a depth of 60 metres off Point Glyphadia, Antikythera. They retrieved numerous artifacts, dated between 150 to 100 BC, including bronze and marble statues, pottery, unique glassware, jewelry, coins, etc. 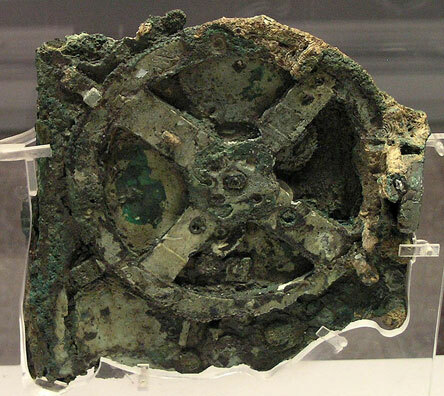 Between the valuable artifacts there was also an unattractive lump of corroded bronze and wood, which initially remained unnoticed for two years, but later caused a real sensation—the historians found, that it is a complex gear mechanism (sometimes called the first known analog computer). Technological artifacts approaching its complexity and workmanship did not appear for the next 15 centuries. The mechanism (a set of 82 remnant fragments) has at least 30 gears and is remarkable for the level of miniaturization and the complexity of its parts, which is comparable to that of 14th-century astronomical clocks, built in several Western European towns. The main purpose of the device was probably to position astronomical bodies with respect to the celestial sphere along the ecliptic, in reference to the observer's position on the Earth. There is much debate that the mechanism may have had indicators for all five of the planets known to the ancient Greeks. The Antikythera mechanism was a remarkable for the time machine designed to predict celestial phenomena according to the sophisticated astronomical theories than, the sole witness to a lost history of brilliant engineering, a conception of pure genius, one of the great wonders of the ancient world.